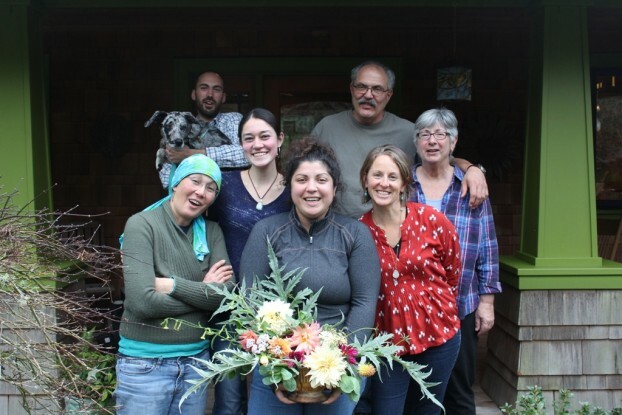 The wonderful Slow Flowers people of Whidbey Island. Front row, from left: Pam Uhlig, Kelly Uhlig, Melissa Brown, Tobey Nelson. Back row: Benjamin Courteau, David Brown and Molly Brown. 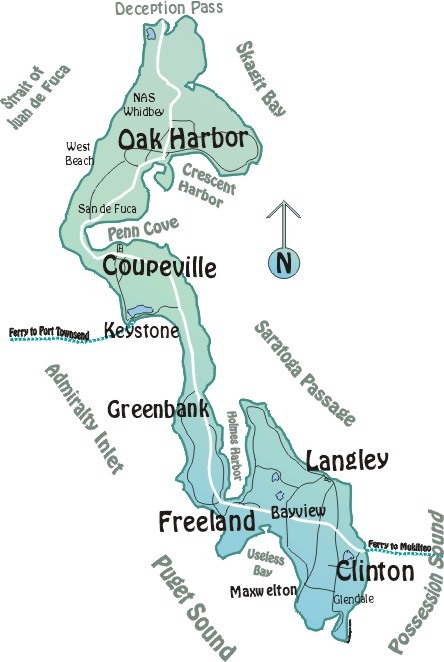 Here’s a map of Whidbey Island to orient you! Notice the town of Langley on the southeast portion of the map and you can picture where today’s guests live, farm and flower! As you know, I love interviewing flower farmers and florists for this Podcast, but what I love even more is visiting them in person to see them in their element — whether that’s out in the shed starting seeds, in the fields harvesting, or in the studio creating something breathtaking. As often as possible, I’ll hit the road and visit Slow Flowers members to share a snapshot of a community, highlighting what’s grown in that region, and introducing you to the people who grow and design with those flowers. For 2016, we’ve already booked a field trip to feature the North Bay Flower Collective, north of San Francisco, and several other destinations are in the works. If you’re interested in bringing the podcast to your corner of the U.S., get in touch and we’ll see what might come together. While it’s located only 30 miles north of Seattle, visiting Whidbey Island takes a little planning because it is reached via ferry from the mainland. The island is notable as one of the longest islands in the country, at 55-miles long, and it lies between the Olympic Peninsula and the I-5 corridor of western Washington. Whidbey Island forms the northern boundary of Puget Sound. Picked on November 12th – pre-frost! 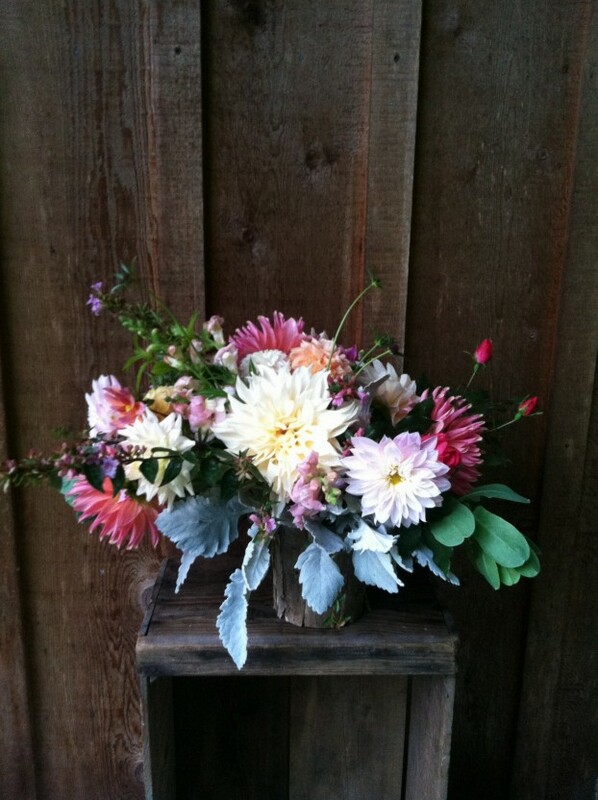 Melissa Brown of Flying Bear Farm grew and designed this lovely arrangement for my visit. In my earlier years as a garden writer, Whidbey was a magnet for fantastic specialty plant nurseries and private garden tours, so I have spent quite a bit of time there. 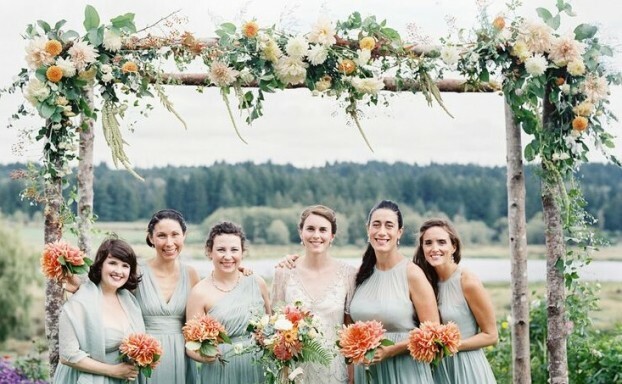 Now, thanks to the efforts of today’s guests, there is a nascent cut flower farming community, which is essential to Whidbey’s destination wedding scene. A few weeks ago, I took a day trip to Whidbey, driving north to the waterfront community of Mukilteo, where I caught the 20-minute ferry ride across Puget Sound to Clinton, on the southern tip of the island. My three stops were concentrated on the southern half of the island, in and around the town of Langley, where there’s a mix of tourism, businesses serving vacationers and owners of second homes, as well as small agriculture. On my first stop, I visited Pam Uhlig and her daughter Kelly Uhlig, flower farmers who own Sonshine Farm, a specialty cut flower farm that packs more stems into a small homestead than you can imagine. 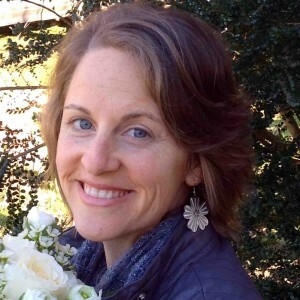 While pursuing a horticulture degree at a local community college Pam apprenticed with Vivian Larson of Everyday Flowers (a past guest of this podcast) – and that’s where I saw her in action. Kelly, a 4-H superstar who’s herself now a college student, is just as committed to flower farming as her mom. 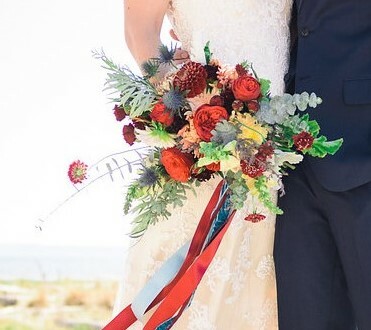 Together the two make a dynamic team; they are now members of the Seattle Wholesale Growers Market, where the local floral community snaps up their gorgeous flowers. 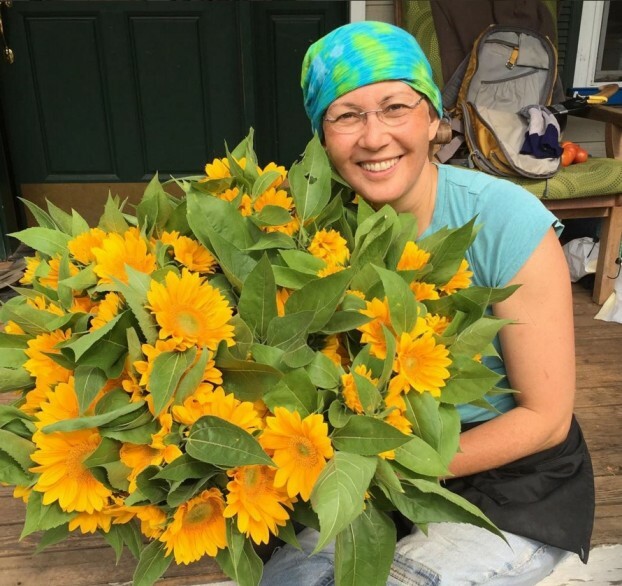 Pam poses with ‘Vincent Fresh’ ~ a favorite sunflower she grew last summer. After interviewing Pam and Kelly and taking a tour of their farm, I went to meet Melissa Brown of Flying Bear Farm. 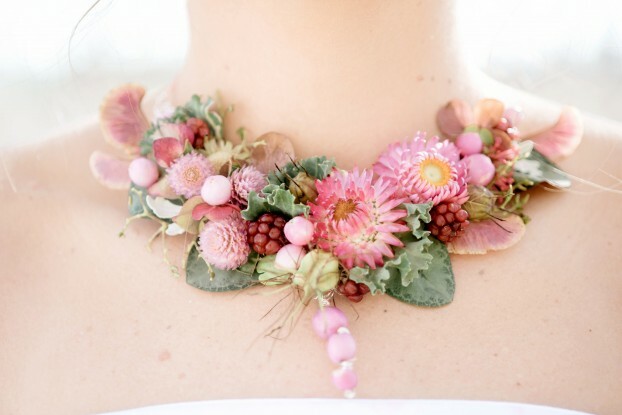 Melissa is a farmer-florist interested in growing flowers for her own floral design business. We met up first on a parcel that a friend has invited Melissa to plant with flowers, which is where we recorded our podcast interview. And then . . . Melissa took me to the Flying Bear Farm headquarters, just outside Langley. That’s where she and her husband Benjamin Courteau have just moved, along with Melissa’s parents Molly & David Brown, into a fabulous compound complete with a barn, two residences, an art studio, and lots of terra firma for growing flowers. Melissa’s folks treated all of us to a delicious luncheon where the conversation only got better with more creative voices around the table. 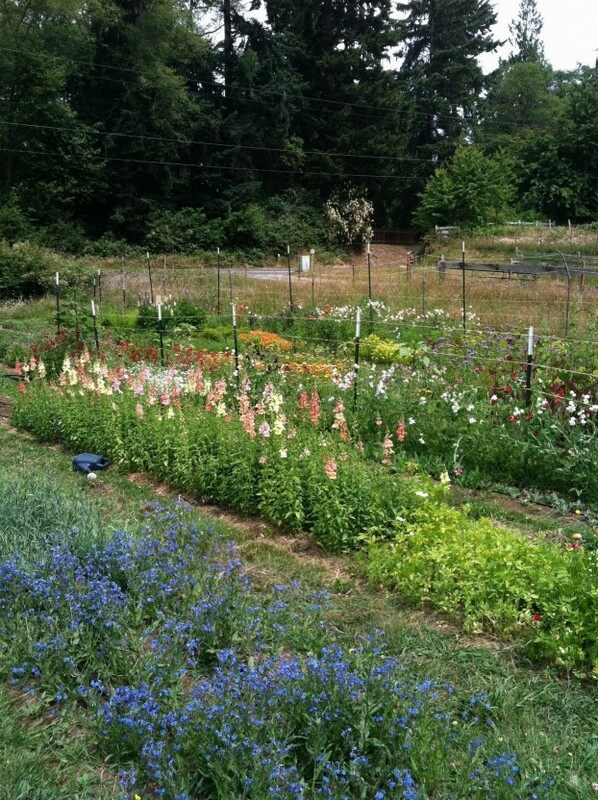 Here’s the land that a friend has lent Melissa and Benjamin to grow flowers on Whidbey Island. 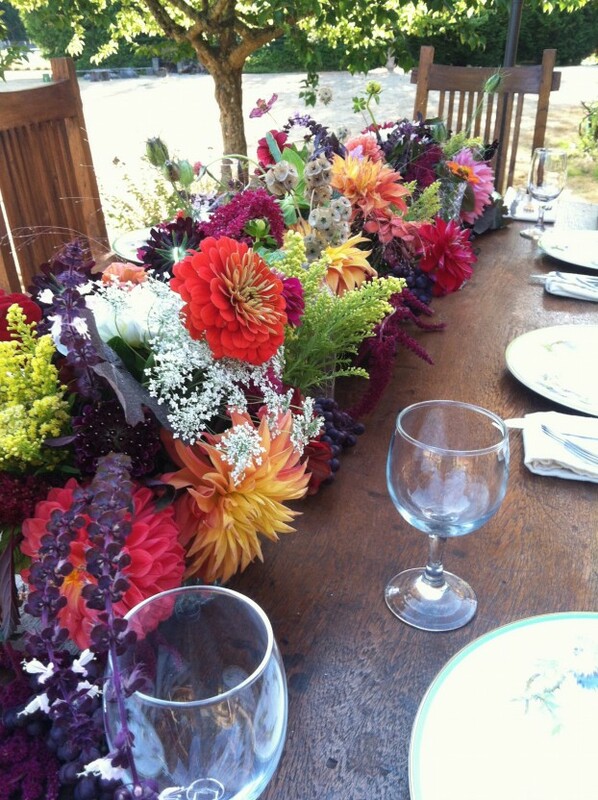 A Flying Bear Farm tabletop design ~ lovely! After lunch, I grabbed some time with our final guest, Tobey Nelson of Vases Wild. 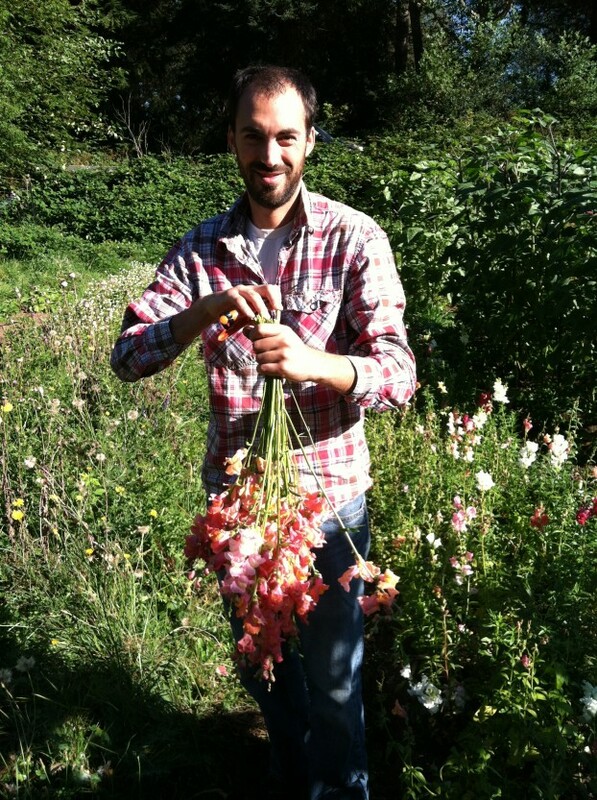 Tobey and I have been talking about this emerging Whidbey Island flower farming-floral design community for a couple of years so I credit her with pulling together my field trip. 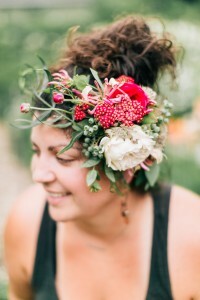 She has an extensive background in landscape design, fine gardening and wedding & event florals, which makes Tobey particularly passionate about sourcing from local flower farms on Whidbey Island. That said, it’s not unusual for her to jump on an early-morning ferry to come into Seattle where she shops for flowers grown by the farms of the Seattle Wholesale Growers Market. Please enjoy each guests’ unique perspective on growing flowers, island style. 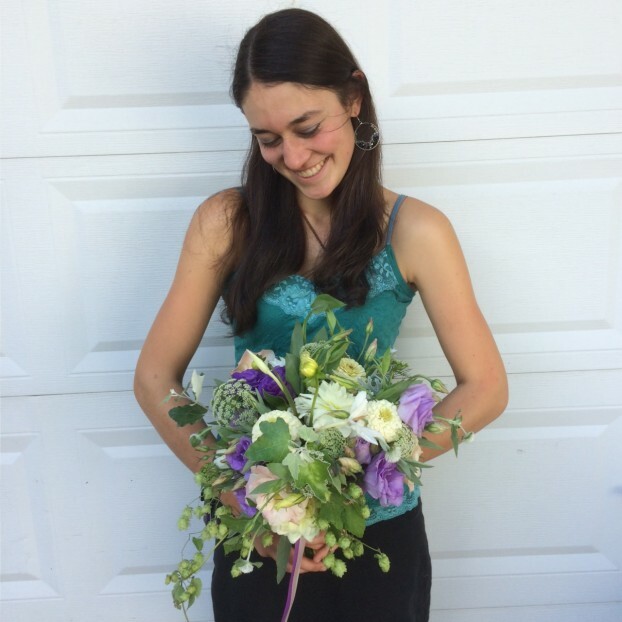 They are building a creative interdependence that is a small-scale model of what can and should happen in every community where flower farmers and florists come together. Thank you so much for joining me today. Episodes of the Slow Flowers Podcast have been downloaded more than 74,000 times and I thank you and others in the progressive American-grown floral community for supporting this endeavor. 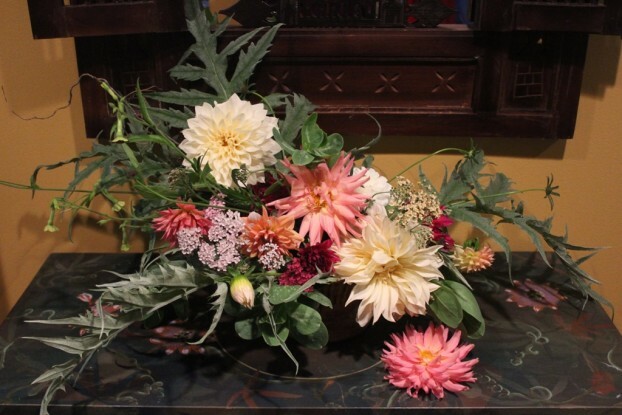 This entry was posted on Wednesday, December 9th, 2015 at 12:10 pm	and is filed under American Grown, Blog Posts, Creativity, floral design, Flower Farming, Gardening, General, Plants, Podcast Episodes, SLOW FLOWERS Podcast. You can follow any responses to this entry through the RSS 2.0 feed. You can leave a response, or trackback from your own site. 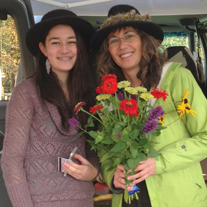 I’ve bought flowers at the Langley market from Melissa, so happy to read about her Flying Bear Farm. Thanks for the story!